You've left out the fifth option: ignore the comments. It works for many bloggers. Yes, but so many commenters ignore the posts, turnabout is fair play. For the record: since people have stopped commenting on my posts, I'm leaving the comments open on my posts as a clear plea for attention. "The lambs are the young of the flock. So, then, we ought to look specially and carefully after those who are young in grace. They may be old in years, and yet they may be mere babes in grace as to the length of their spiritual life, and therefore they need to be under a good shepherd. As soon as a person is converted and added to the church, he should become the object of the care and kindness of his fellow-members. He has but newly come among us, and has no familiar friends among the saints, therefore let us all be friendly to him. Even should we leave our older comrades, we must be doubly kind towards those who are newly escaped from the world, and have come to find a refuge with the Almighty and His people. Watch with ceaseless care over those new-born babes who are strong in desires, but strong in nothing else." I'd hate to see the comments ended because many of them are substantive and contribute to the discussion, but on the other hand there are a lot of railers and derailers. It's just a shame that we so easily bypass the word "edify" in order to make our own points. @Dan, I'm a longtime teampyro reader but rare commenter. Just as a datapoint, I honestly don't read the comments very often, but I do read, consider and often profit from most everything that comes across the "new posts" feed. 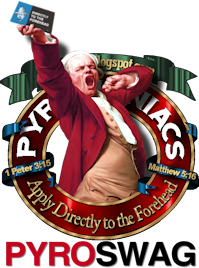 To date I myself am basically what y'all would call "weakly-professed Christianoid", but you should know that TeamPyro is one of the things that gives me serious pause in that. In short, I could live without your commenters but I'd be mighty disappointed if you (or Frank) gave up writing this stuff. FWIW. jbboren — you saying that really puzzles me. I actually spoke to that at great length. I know it's a long post, but... are you trying to make me play the "You didn't read the post" card?? The Calvinist Gadfly will go live again in September. We all had a really full summer, and we have a lousy editor in chief. Much appreciated! Obviously this is a moderated blog, but I have never felt that you all were shamelessly censurious. That, in my opinion, sets you way apart from the pack. Again, much appreciated! I was only answering a question. I'm saddened, but not surprised, that a post like this is even necessary. Dan - You gotta moderate. otherwise the threads will be dominated by crackpots, trolls, atheists and RCC/KJVers. You know, like they do everywhere that isn't moderated. Frank - I always read your stuff, but don't usually comment because what you say makes sense to me. Aside: I appreciate that Dan is picking up bad Spanish in Texas: "donde esta frijole?" lol It took me a second to get that joke. I am a fairly new reader and appreciate the articles on Pyromaniacs. I have a question. My daughter is a longtime Christian, and well taught/learned in basic Bible from her own self study and from home/family life--no formal education. Her husband is a very new Christian (2 years)with absolutely zero theological background. He has been expressing a desire to do mission work. I would like them both to go through some kind of basic program. I have found a few online free theology programs. However, after looking at them, I think that they will leave the husband behind. Can you recommend any online program with basic OT/NT Survey, or basic Bible study that they would be able to do together. They have very young children, and attend church (an excellent church) regularly, but not a Sunday School. They are not evening TV watchers, so I think that they will definitely avail themselves of an online program. Their interest level is high at the moment. Oh now, don't blame that one on Texas. I brought it with me. It's companion to "Como esta frijole?" ("How you been?"). Yes, my strongest recommendation would be that they work with their pastor, and get his direction and help — or perhaps his own tutelage! You know, Dan, I think those of us who read closely had kind of figured all this out. And then there are the trolls who don't care. This post is great for you (or others!) to point to and say, "It's not meanness that led to that moderator's comment; it's purpose and discipline." It should be helpful to some casual readers who wonder why this site sometimes seems "mean." Exactly the point, TC. Well-read. 5) Stop creating posts that openly invite respones on theological viewpoints that your in disagreement with, also avoid inflammatory language that is intended to evoke a response. Hearty support & approval in whichever approach you take, DJP. I vote for #3. DanP said, "This isn't a democracy." I tell my kids at home that same thing followed up by, "It's a dadocracy!" Just like my young children need an occasional nudge in the right direction, so it is with a lot of the people who comment here. As your time taking care of your family and Church are important, I say go with Option 4. 1) I pay my monthly fees faithfuly, thank you very much. 2) Why not get a young Timothy to help moderate the meta? 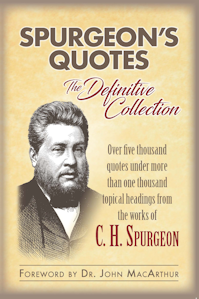 We have a fine gent watching over Spurgeon, another (I assume) posting Phil's worthy works. Why not a faithful shepherd to help in the meta? 3) I thought frijoles were beans, not beens. But my spanglish is rusty. So, no "what does this post mean to me...." stuff? Something like that? cenIt is difficult enough writing a meaty post, but to also moderate it requires a yeoman's effort; and to do this more than once a week requires a level of commitment, and a calling that most do not have. And to also consider that this is neither your's nor Frank's day job, that neither of you are single hermits, and that you both have other blogs...well that does elicit (from me) a great deal of respect. So now that you have set the record straight for those who have never gotten it, blog on boys, blog on. Why not appoint some of your more regular commenters who demonstrate a resistance to the "diarrhea of the meta" the privilege of moderating in your stead? This may help, but I don't know the availability of the best candidates and if, perhaps, their schedules are much like your own. "I view this as more akin to a Bible study, where I am responsible for leading the discussion in a specific direction — and making sure it gets there and stays there." This is an interesting statement to me. I mean, let's face it - we've all probably been in that Bible study with the person who throws everything off-track, and never seems to realize that what they're saying is the exact opposite of what the text is saying. Some of us have led these studies, and had to grow in our ability to correct, redirect and guide this type of element in the group setting. So Dan, would you say that the way you correct and re-direct wayward "mouths" here is correlative to how you do so in an actual in-person Bible study? Or are there other factors that make how that is done look different in each scenario? Yeah, 'cuz that would only violate all three senses in which Dan sees his role as "semi-pastoral." This option would be "choosing poorly," if you know what I mean. Aaron, by their nature, actual real-live Bible studies tend to attract fewer of the quick-draw popoff drive-by assaults that blogs undergo. Trolls don't have the protection of distance and anonymity and cover for sniping. You have to "own" what you say. Having said that, yes, leading a group-participation event with gentle firmness is an art in which one can only strive to achieve adequacy. Some dear souls are simply unwilling to say the equivalent of "OK, let's take one last question," and make it stick; or to say, "Well, let me give you a response to that, and then if you like we can talk with it afterwards," and make that stick. Or to say, "No, I think you know our church's teaching position, and this isn't a constitutional rewrite meeting, so you really aren't welcome to present your 25-page paper in this meeting." But that's what's necessary. I can understand where your position or. I do not comment here much because of the time it take for me to write a replay with a leaning disability. I believe the comments problem is a greater problem of the 24/7 social networking digital culture; people are losing the ability to civilly and logically debate. I was dismayed with comments on Fox News and WSJ; thousands of post most by drive by, off topic, demagogs. Yes such comment can kill a blog. I lean more to not or very limiting comments on my blog. Fox news has closed their comments feature and other are moving to Facebook were more difficult for anonymous drive by comments. I prefer to be a tyrant on my blogs one has only two chances if I get a whiff of demagoguery, that person is banned. Yep. Or take YouTube. Mercy, those metas are wretched hives of scum and villainy. Not worth wading through the sewage to find the few sane sparkling gems of marginal sanity. But some high-profile Christian blogs aren't a whole lot different, in terms of Biblical sanity. Many comments are actually more helpful to me than the post itself. I have so very, very much to learn and the comments will unpack the post more. Often I'm unclear on a point and/or have a question that will be resolved for me in the comments by someone expanding on the post. I truly appreciate the teaching I get from both the Pyros and the commentors. And also, lots of folks are absolutely hilarious (in a good way). Combox: It's not a Democracy - it's a Dan-ocracy. "Yeah, 'cuz that would only violate all three senses in which Dan sees his role as "semi-pastoral." Semi-Pastoral? I missed where being incendiary was a biblical pastoral quality, even semi-icendiary for that matter. Isn't the name of this blog Pyromaniacs, strange, if someone starts a fire there will be onlookers and people will even try to put it out. If you don't like the attention your fires get STOP STARTING FIRES. Then there's the flipside, aka option #2, where comments are either disabled or not an option. This has its advantage, such as making a stand-alone statement. But it's hard to start a discussion this way, at least the kind directly connected to the writing. For example, Carl Trueman has written several articles at his blog that give striking food for thought and would be fantastic conversation starters, but readers have no avenue for such (unless I'm just the dolt who hasn't seen how!). So I sincerely appreciate that you haven't taken this route, and all the time and soul the Pyro bare-knuckled-bloggers (BareKB's??) pour into this ministry, for it truly is one. I rarely waste my time looking at comments anywhere else, but here there really are some uplifting, edifying, corrective, reasonable, thought-provoking and Word-rich nuggets. Thanks! Biblical truth is always incendiary, like a "refiner's fire". Well, I appreciate all of you. (smile) the invaluable information here is a think tank from men who no doubt have been walking with the LORD and have attained such wisdom. I apologize that I don't always comment since some posts are just recondite(for me). but they challenge me and sometimes I have to read them 2wice or thrice. when I read some of the input it really helps me..
there is a feature where you can have members only isn't there? I'd also like to just add that it's great to see the "A WARREN OF IGNOBLE FURRY TICKS" label tagged on another post. Well done. "A [WARREN] OF IG[NOBLE] [FUR]RY [TICK]S"
To which I say: "holy frijole"! I'm really getting dull-witted in my old age. I'm I the only one who doesn't catch these jokes until they are 'splained to me? I'm another one of those grateful and regular (but silent) readers. Perhaps more of us should have said "thank you" long ago. I'm a busy pastor as well, but I do drop by several times a week just to to see what new encouraging or challenging topics you guys write about. Thanks for the hard work you put in here, and I specifically thank you for today's well written post. I see biblical truth more related to mercy and love then fire. I read but do not comment often. I pray that you become ubiquitous. Jules cited scripture, while you told us how you feel. Bblical truth is more related to mercy and love then fire. Is this the part where I say that I think truth is more like the grease falling off bacon than it is the ashes left over from a fire? I mean, if we are just going to make up comparisons. I learned all this about truth from something that was said to my spirit, which I am told is more rare than a word from another person but less rare than a dream. If only the Bible gave us some imagery, to describe how it works. What you see is irrelevant, Ian. Scripture alone is our sole authority. I feel like, or better said, semi-feel like you should read Psalms, or Ephesians if you are interested in how you should view and share biblical truth. Or if you feel or semi-feel like your always a Prophet or a semi-Prophet confronting false prophets or anyone that doesn't view Scripture like you see it, I would read Jeremiah. Or you can read both and apply when necessary, that is if you feel like it or semi-feel like it, and of course, most importantly, if Tom Chantry approves. God's word is "like FIRE"- and "like a HAMMER that breaks a rock in pieces"-Jeremiah 23:29, it is "living and active sharper than any double-edged sword"-Heb. 4:12. Do we know each other? how would you know what I view as irrelevant unless you view yourself as a Prophet or a semi-Prophet or maybe it's just your feelings. Ian, do you drive a semi-truck for a living? No I don't, but you asked, which is commendable. DO you have something against semi-truck drivers? If you do you could have said, "You drive a semi-truck for a living", not truly knowing my profession, so you can disqualify and disagree with everything I say about transportation but you didn't. Again, Ian, what you view or do not view is irrelevant. I do not need to know you to affirm that Scripture alone is our sole authority. The question is not, "What do I think God's Word says?" The question is, "What does God's Word say?" You could take on some people who'd act as moderators but not necessarily as writers. Do you ever read other people's comments on Scripture? I think you'll find the order viewed differently here: biblical truth related to fire, then love and mercy. Great post, by the way. 5-star quality. 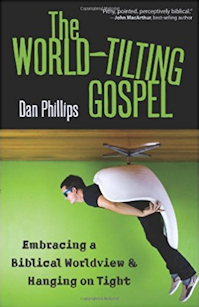 Lastly, Dan, I'd appreciate your prayers as I plan tentatively to start a ladies Bible study this fall. 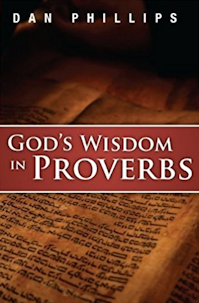 I'm leaning strongly towards Proverbs, and using your book as a guide. And I have a tendency to not be strong in those ways you were describing yourself, but greatly need it. Thanks in advance. I think? Are you sure you wanted to say, "I think"? Why would I have said it any other way? If you are a thoughtful, careful reader, if you are able to be instructed, then...yes. If you have an axe to grind and are inclined to argue without listening, then...you will not likely find what I'm talking about. I was being somewhat optimistic. Um, Ian, I was joking, as in after you used the term "semi" about a zillion times I thought perhaps it was a Freudian slip related to driving a "semi." Don't worry though, my wife doesn't think I'm very funny either. Kerry James Allen, I thought you were funny in a cute way-(I smiled). I thought of "Semi"but his name was spelled "Semmi" in the movie "Coming to America" after I read your post..
Why do I have the term Knight-Errant stuck in my mind after reading Ian's comments? Exactly , however your colleagues here can't stomach that you shared with us how you "feel". Get your axe out so you can be taken seriously. You have understood exactly nothing of the conversation here. Furthermore, you have taken this discussion far afield from Dan's initial post. And since Pastor Dan is probably off doing important stuff (like ministry) right now, I'll tell you for him: venting your frustration about other posts on this meta is not smiled upon. Commenting without interacting in any meaningful way with the original post - while common - is not really tolerated either. And taking an aggressive stance with a Christian sister who has dealt with you charitably is not only rude and ungentlemanly, it is deeply offensive to most of the commenters here, and probably also to most of the quiet readers. Perhaps you've done all the damage in this meta that you ought to do. Dan- your post reveals the heart of a true shepherd. If anyone is "cheesed off"- it might be because they don't understand and respect that role and the responsibility that pastor-shepherds carry. If you makes YOU feel better shut me down, but your explanation why is laughable. Your explanation was clear, cogent and anything but laughable. "What you see is irrelevant, Ian. Scripture alone is our sole authority." I thought you were accusing me of not taking Scripture as sole authority. Understandable the way it was worded and my experience on commenting here. It turns out that's not what you meant. I doesn't seem the goal of these comments are to understand one another but I knew that going in. Wow...this meta has been fascinating, and sad to read. I am an avid reader and occassional commenter. I only comment if I have a strong conviction about something that has been said in the post or is being said in the comments. Ian - I enter the fray with some trepidation because it appears to me (correct me if I'm wrong), nothing anyone here is saying to try to explain or demonstrate how you might possibly have missed the point of the post is really getting through. Regardless of our "feeling" and "thinking", scripture has been presented that demonstrates that there a refining nature to Scripture that, I would argue, is a true deomonstration of God's love and mercy. His goal after all is to make us more like His Son. And therefore, Scripture will confront us and make us uncomfortable and possibly even offend us as it deals with our sin. That is indeed the most loving and merciful thing a Holy God can do for His children, don't you think? If we use Paul as an example, he demonstrate this in his dealings with the churches. I do believe he called the Galatians "foolish" for their behavior with the Judiazers that were causing havoc in their congregation and was quite blunt in his displeasure and dismay with them. He was no less blunt with the Corinthians when he confronted them with the multitude of issues going on in their congregation. What Dan is doing is no different from my view. And I personally applaud it. It is refreshing and God-honoring. Chantry for the gold. Ian, since you seem to be semi-irritated by Tom, and the semiabstract content of Pyro, which is semibreve in relation to Scripture, and your comments toward the ladies are rather semicivilized, and you appear semiconscious at times, maybe you need to take a semipermanent break from the comments. Partly, it's been exactly what Chantry said. But then, since not too much harm was being done, I thought I'd just take the chance of allowing Ian to provide a relatively mild illustration of what I was talking about. First, I really did write this for the reason I gave: to be able to refer back to it later. So what a nice treat it is for folks like Greg Howard, OFelixCulpa, Nash, threegirldad, Larry Geiger, thomcole, Morris Brooks, Carl C., Dan Rolfe, AJM, Merrilee and others to take the time to say such kind and encouraging things. Thank you. I do appreciate it. Ian…you stated, "I missed where being incendiary was a biblical pastoral quality, even semi-icendiary for that matter." You then stated, "I see biblical truth more related to mercy and love then fire," sans any Scriptural reference, which leads the reader to believe that your position is based upon your own personal interpretation of Scripture. As any student of Scripture knows, this is expressly forbidden (2 Peter 1:20), thus my statement, "What you see is irrelevant, Ian. Scripture alone is our sole authority." So again, the question is not, "What does Scripture say to me?" The question is "What does Scripture say?" If you go back and read my initial comment you'll find what I said was twisted and became something else. Having read here for many years, commenting infrequently, I see the purpose of these posts are to do exactly what the title of the blog says "setting the world on fire". There intention is to light a fire, get attention. Not only serve as a refining fire as found in Jeremiah. So I find it odd that someone would complain the attention when that's what is desired. Yes the word of God is a refining fire, but not ALWAYS like Jules said. Sometimes it acts as water, two-edged sword, hammer, depending on how the Holy Sprit moves on the heart. What you have done is provide us with the spectacle of someone who evidently fundamentally does not even understand the purpose of this blog — including even the everywhere-visible Biblical reference for its name — and yet takes on himself to tell us all that we're doing it wrong. But that's easily correctly. And was. In fact, it could have been corrected if you'd just read the post attentively! Yet your next move was basically to pull up a box of Kleenex and sob about how mean everyone is (rather than admitting you were wrong, and moving on). And so you can all see that, from Ian's first wrongheaded lament about (horrors!) speaking ill of Jimmy Swaggart and Jim Bakker and their host denomination, much of the rest of the thread became devoted to the goodhearted attempts of goodhearted folks (with, I am sure, better things to do) to set Ian straight, when Ian had absolutely no intention of receiving a syllable of help, no matter how transparently relevant. That is just the slightest whiff of the odor of what happens with unmoderated metas. Instead of talking about the post's contents, it becomes a therapy session for someone with his own agenda. So, Ian, to you: you've said your piece, and chanted your threnody. If you'd like to apologize to anyone or acknowledge their correction, you may. Otherwise, you're done for this one. I'll leave your words up as a testimony to your complaints. Oh, and Michelle. I should have thanked Michelle, too. Come more often, Michelle! Thx. "Jeremiad," if you prefer. Yeah, but I wouldn't have learned a new word if you'd said that. And that is what I live for. Hey, it really IS all about ME!!! Pyromaniacs: Providing light and insight into neologisms, threnodies, jeremiads, ululations, and the lucubratory of Tom Chantry. And at discounted rates of course. My advice is free, too, and worth every penny. And, almost as if scheduled to illustrate my point, check out the meta to this post by very good brother Denny Burke. Don't misread me as intending anything negative about Denny. I'm not. But that meta is the sort of thing I'd never want to let happen, myself, me. Which is what I was trying to explain.